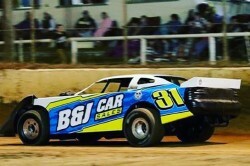 The Brims Concrete Super Sedan Series supported by MPR moved to Carina Speedway, Bundaberg on Saturday night, with 2015 Queensland Modified Sedan Champion, Brodie Boss taking the victory. Prior to the twenty lap main event, four qualifying heats were held, with Ian Brims having a dominant win in the opening heat, winning by a third of a lap. In contrast, Josh McLaren would win heat to by just 0.174 over Wayne and Justin Randall. Brims backed up his opening heat win by taking heat three, downing Nicholas OKeeffe and Brodie Boss, while Wayne Randall would take the final qualifier over Justin Randall and Gordon Shaw. After the marble draw, Brodie Boss and Justin Randall would find themselves on the front row, while Wayne Randall and Josh McLaren would start on row two, with Brims and Sam Grundy on row three. Despite the lead three positions not changing throughout the twenty laps, nothing separated Boss and the Randall duo. With the race going without a stoppage, Boss would break through for his first Super Sedan main event win, defeating Justin Randall by just 0.213 in a great finish as Wayne Randall was only 0.762 off the win himself in third. Brims, McLaren and Gordon Shaw completed the top six.